In terms of overall attendance, Dreamforce is the world’s largest software conference and the second-largest technology conference next to CES. And Dreamforce’s current growth, it’s poised to overtake the consumer technology event in 2017. 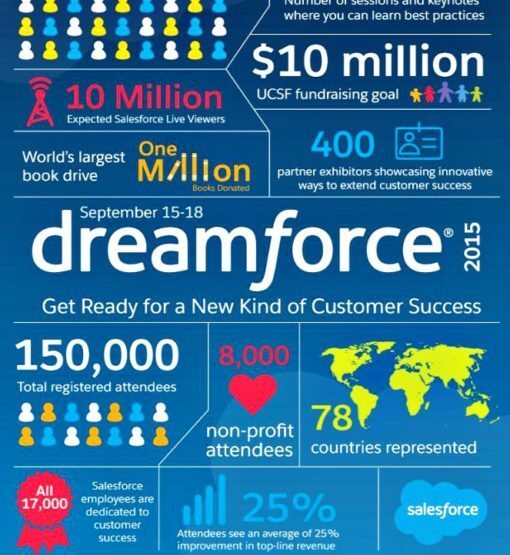 But what are the officially reported attendance numbers (“registered attendees”) for Dreamforce? How about when the conference first started in 2003? Look no further, we’ve done the research and you see the dramatic growth of the conference from small gathering to humongous, traffic-congesting, downtown-swallowing, economy-impacting B2B circus that draws nearly 200,000 attendees and draws acts such as U2, Foo Fighters and The Red Hot Chili Peppers. Having attended six Dreamforces (2011-2016), I’ve seen firsthand how Dreamforce has grown. I was able to see the “campus” sprawl across downtown San Francisco; where companies took over (officially) cafes and other storefronts. The venues have ranged from AT&T Field to Civic Center to the Cow Palace. The conference continues to sell out faster and faster and if you don’t have your hotel a month out, you might be staying near the airport (taking a Lyft from SFO into the city) or a friend’s house. At the conference’s current pace, it’ll hit 200,000 registered attendee within the next five years. That is a quarter of the city’s current population! How long will Dreamforce continue to grow and if it does, how long before it becomes too big for San Francisco?